Origin and Habitat: Cochabamba (Tarata, Arani, Cliza, Sivingani, Mizque, Anzaldo, Sacabamba, Rio Caine and adjacent area) Bolivia. Type Locality: Anzaldo, Cochabamba, Bolivia. Altitude: 2000-3500 metres above sea level. 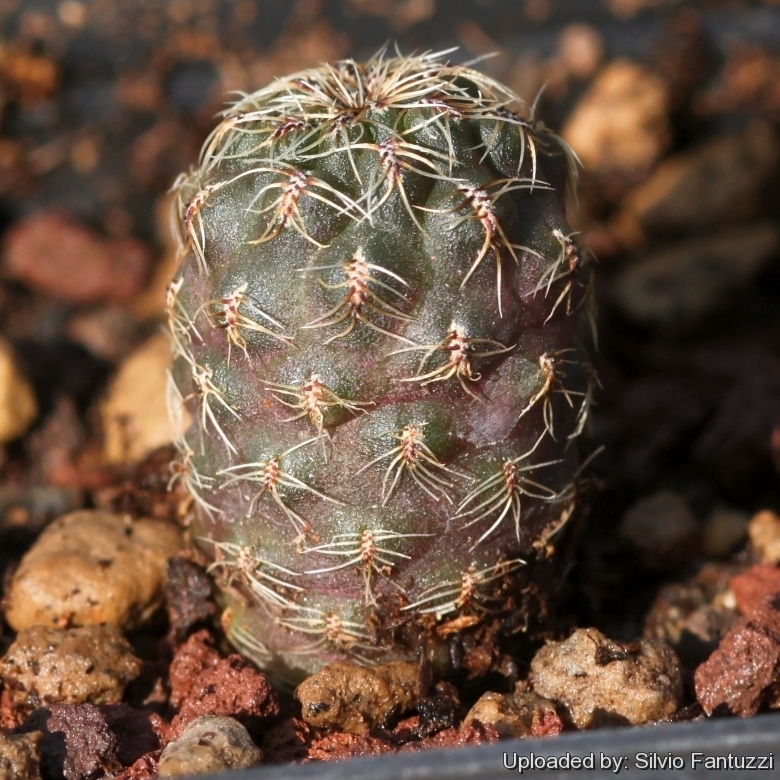 Description: Rebutia taratensis best known as Sulcorebutia taratensis is one of the innumerable local form of the very variable Rebutia steinbachii (= Sulcorebutia steinbachii). It distinguishes for its small, free clustering bodies. The flowers are bright purple and the spination of well-grown specimens is pleasing. It is one of the tiniest Sulcorebutia. The var. minima has minuscule bodies which cluster like a mad, readily forming crowded cushions with hundred of heads. Note: Rebutia taratensis is apparently a neotenic variety of the species in which juvenile spination is retained throughout the life of the plant, while many of the other varieties are dimorphic (short spined juvenile forms transform at maturity to strongly spined forms). Habit: It is a clumping plant growing readily forming, especially in cultivation, clumps of hundred of heads from the base. Stem: Single heads 15–30 mm wide, and 25-50 mm tall, globular, to clavate somehow apically depressed, very dark tanned green to dark magenta-green sometime tinged red, not completely hidden under the covering of spines. Cultivation and Propagation: Very difficult to find high quality plants of this species in cultivation, S. taratensis loves a very permeable, coarse mineral soil as well as to be strictly kept dry throughout the winter quiescent period since it is very sensitive to any moisture excesses, To prevent rottenness it is also advisable to surround its root neck by very rough sand or grit, this help a fast water drainage and an appropriate air circulation.